The amount of additional heat that entered the Arctic Ocean during the the summer of 2012 due to the decrease in sea ice was approximately enough to power the United States for about 26 years. The trillion-dollar question is: how will this affect the weather? Is our warming planet the driving force behind the unusual weather patterns witnessed recently all around the United States? A webinar (“Our Wacky Weather and Disappearing Sea Ice: Are They Connected?”) hosted by the Alaska Center for Climate Assessment & Policy attempted to analyze this challenging question, with a focus on weather in Alaska. Jennifer Francis, a Research Professor at the Institute of Marine and Coastal Sciences at the Rutgers University, was the keynote speaker on this issue, providing her expertise on weather and the atmosphere. According to Mark Twain, “climate lasts all the time, weather lasts only a few days.” If Mark Twain could differentiate between weather and climate all those years ago, why do individuals continually get it wrong today? People, mostly those who deny climate change in the first place, have always exploited cold weather events to argue that global warming doesn’t exist and isn’t a problem worth addressing. This sort of fallacious reasoning is what makes weather and climate change so difficult for many people to connect. A warming climate affects the weather, but we must consider long-term trends, not just one particular cold spell in Florida over the winter. This logic also applies to the flip side of the coin; no one particularly warm weather event can be attributed solely to climate change. Credible climate scientists use trend lines of weather over long periods of time in projecting where the climate is headed. Other less noticeable changes have been occurring in other parts of the Arctic, including Greenland. Using the meticulous satellite measurements from NASA over the last 30 years, the trend suggests that surface melt of Greenland’s ice sheet is expanding. This year marked an unprecedented melting of Greenland’s ice sheet, the greatest observed melting over the last 30 years. Almost the entire ice sheet, or 97 percent, had thawed in only a few days. These eye-opening changes are very consistent with the warming trends and models. How do we know human activities have anything to do with the warming we are witnessing? Can’t we chalk it up to natural variability? Francis, using today’s most sophisticated climate models, argues that without the burning of fossil fuels our climate would be cooler than it is today. By using complex calculations and the laws of physics, climatologists are able to accurately reproduce the climate over the past century. To test the validity of anthropogenic global warming, researchers altered different aspects of the models in an attempt to mirror temperature observations over the same period of time. When simulating a world without human industrial activity, models fail to reproduce an accurate representation of the previous century’s temperatures. Now, including anthropogenic global warming into the model— that is to say accounting for all the greenhouse gases being added to the atmosphere by human activity— along with natural forces (solar variation and volcanic eruptions), the model closely reproduces the observed temperature changes over the given period. “So we know now that the greenhouses gases in our atmosphere that humans have put there are accounting for most of the warming since about the middle of the 1900s,” says Francis. Over this long time period, when temperature changes the amount of carbon dioxide in the atmosphere subsequently changes. Francis attributes this to melting of permafrost and an increase in wetlands, which both release carbon dioxide into the atmosphere. What we are currently experiencing though is quite different and remarkable. What’s more obvious is that the Arctic ice is shrinking at an alarming rate, and this can be attributed to greater concentration of greenhouse gases. 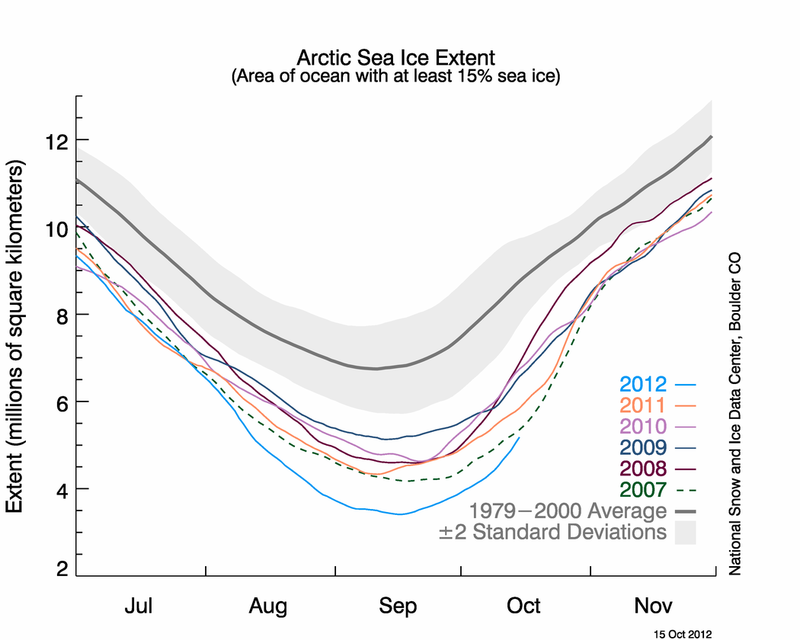 The Arctic sea ice is thinning, retracting, and growing younger every year. With less and less ice present in the Arctic to reflect the sun’s radiation, more and more of this energy is absorbed into the ocean. The temperature differential between the equator and the poles creates this ‘hill’ that drives the ‘river of wind’ known as the jet stream around the Earth. We all have seen depictions of the jet stream while watching the evening weather report. This river of fast flowing air is what drives weather over the United States. Due to recent warming in the Arctic, the hill has effectively declined or flattened out, causing the jet stream to weaken by up to 15% according to Francis. “So this jet stream actually makes our weather. It’s literally like a river of air high up in the atmosphere that flows around the Northern Hemisphere. To the south of this jet stream is where the warm air is, and to the north is where it’s colder. These waves in the jet stream, which are almost always there, are primarily initiated because of mountain ranges around the Northern Hemisphere. These waves are what determine whether we are in a stormy pattern or a dry pattern.” Depending on which side of the jet stream you find yourself, this determines the surface weather. What Francis and others have also noticed is that when the jet stream decreases in speed, the “river of air” tends to get wavier. “You can think of this sort of like a river. When a river is flowing down a steep mountainside it tends to go pretty straight, it wants to go right down that hill. As it gets out onto the coastal plain where the land is very shallow, it tends to meander. A jet stream behaves very similarly, when the winds are very weak it tends to be wavier.” As the jet stream slows down, the wind currents shift slightly to the north, causing unusual weather patterns and unprecedented weather events. Watch this NASA jet stream animation that shows actual instances this summer in which the jet stream meanders like a rollercoaster over the United States. These observations have a particular relevance to the record weather witnessed this past summer. These theoretical concepts developed by climate scientists like Francis are being put to the test here and now in the United States. Due to the changing jet stream, parts of southern Alaska experienced record flooding, while the states located on the other side of the jet stream, in the Pacific Northwest and the Midwest, experienced record temperatures and drought in September. These weather patterns can be attributed to an altered jet stream due to climate change. According to Francis, as the jet stream begins to shift and slow down, this will lead to an increased probability of extreme weather like cold spells, heat waves, flooding, prolonged snowfall, and drought. She refers to “extreme” in this instance as outside of the normal trends and lasting for several weeks at a time. The slow movement of the jet stream will cause these systems to move slower over the United States, making them more persistent and longer lasting. They will stay parked over much of North America for longer periods of time. In other words, unprecedented weather will soon be the norm in our warmed world. Predicting future weather patterns based on these changes is something that Francis is working on, a problem for continuing research. How the waves in the jet stream set up relative to you will influence what kind of weather you experience. One thing she does expect is that weather will continue to get more “wacky” as the jet stream continues to change. What is occurring before our very eyes is climate change at work. Not in the next generation or a century from now, but now. The deck is being stacked against us. In our society, due to the anti-science movement, many people have their eyes shut to the reality that climate change is a problem that must be addressed. Francis and I share the same hope that this “wacky weather” will provoke movement on the issue of climate change. The US cannot afford to have more Sandy-sized wallops to the side of the head. As Paul Barrett of Bloomberg Businessweek wrote, “It’s global warming stupid,” and it’s time to do something about it. This entry was posted in Assessments of Climate Impacts and Adaptation, Climate Change Education and Communication. Bookmark the permalink. And article at Get Energy Smart Now mentioned another aspect of global warming’s effects that relates to super storm Sandy. “The north Atlantic ocean is heating faster than all the world’s oceans because of the increased flow from the Indian ocean to the Atlantic ocean.The rapidly strengthening greenhouse effect produced by exponentially increasing human emissions of greenhouse gases is affecting earth’s climate unevenly. The North Atlantic ocean is heating the fastest of the world’s oceans.